Figure 1-6 Simulated natural versus human-induced global temperature, 1890–2000. 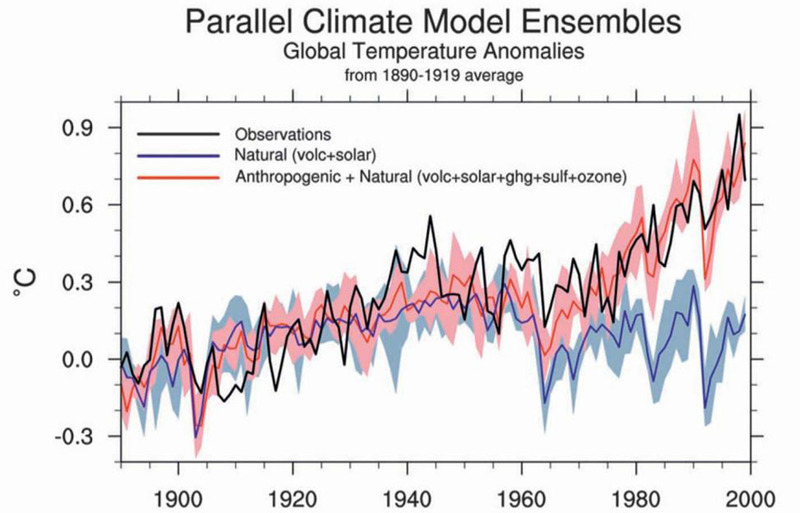 Using an ensemble of four climate models, scientists can differentiate between human-induced trends and natural trends in long-term global climate variables. Here, the observed change in global annual air temperature (black line) is compared to the predicted range of air temperature with only natural climate variability (blue line with blue shading) and the predicted range with both natural plus human-induced factors (red line with pink shading). Natural factors include volcanic and solar activity, while human-induced activity adds the effects of greenhouse gases, sulfates, and ozone (Meehl et al., 2009). In the Pacific region, high ENSO-related variability makes it more difficult to separate the long-term and short-term trends.